The Lakeshore Lodge, a stately home that has graced the cover of Lindal Living Dreams planbook for over decade. On its exterior, the lodge successfully combines several traditional roof forms into a handsome singular design that is at home on a rugged mountainside or a manicured fairway view site. The lodge, with over 5,700 square feet of living area, is too large for most families. 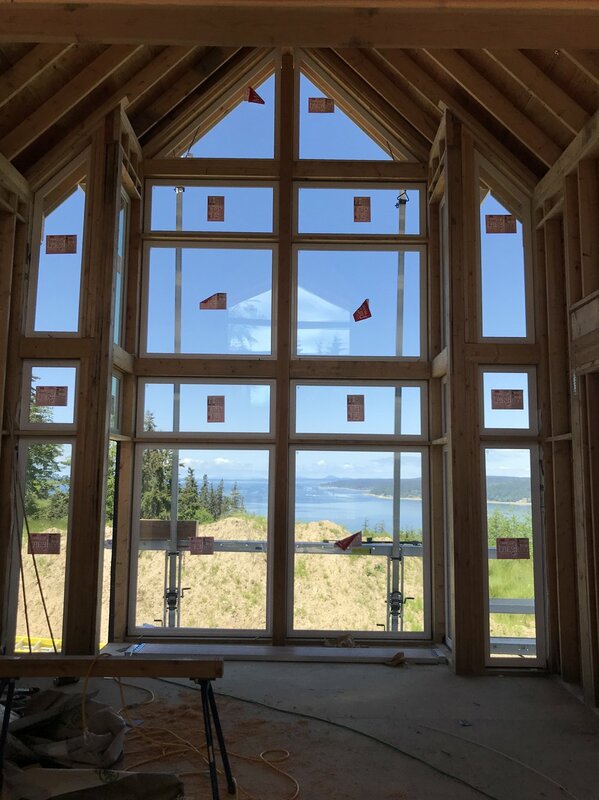 Our clients are planning their retirement home on an open hillside field with a panoramic view of Puget Sound-the type of site that demands a commanding home. They challenged us to design a new 3,500 square foot lodge with the same strength, spirit, and utility as the original Lindal design. By reducing the scale, and increasing the efficiency to control cost as our mission, we utilized the Elements system. The disciplined system provided enormous benefit of reducing design and pricing cycle time to just over a week each for each design iteration. One aspect of reducing the size of original by 40%, was simplifying (read modernizing) the roofscape (and increasing headroom under the steeply pitched roof) by replacing the gabled dormers with shed dormers and the octagonal porch roof with hip roof that caps a four-season porch that extends the living and dining spaces for hosting larger groups without resorting to cavernous spaces. The client benefitted from a design that used material more efficiently and saved money as well as time. While the size of the house was reduced by 35% the cost of the Lindal material was reduced by nearly 50% compared to today’s cost of the original design. The Elements Classic series was launched this January with the mission of increasing the efficiency of the design and pricing process as well as the material cost. This custom home is now included in the new Lindal Modern planbook as the Creekside 3730.